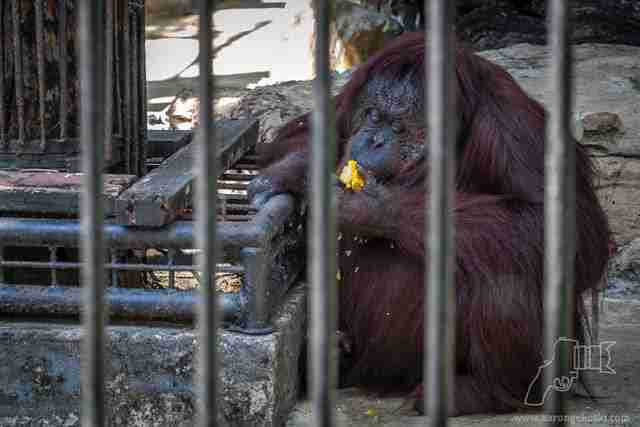 The zoo orangutan held out his hands through the bars of his cage, begging for food. But he wasn’t starving — it was clear he was getting more than enough to eat, and he was terribly obese. This past February, wildlife photographer Aaron Gekoski visited Safari World, a popular zoo in Bangkok, Thailand, to document the living conditions of the resident animals, when he encountered the overweight orangutan. The orangutan continually ate throughout the day, most likely out of boredom, Gekoski explained. 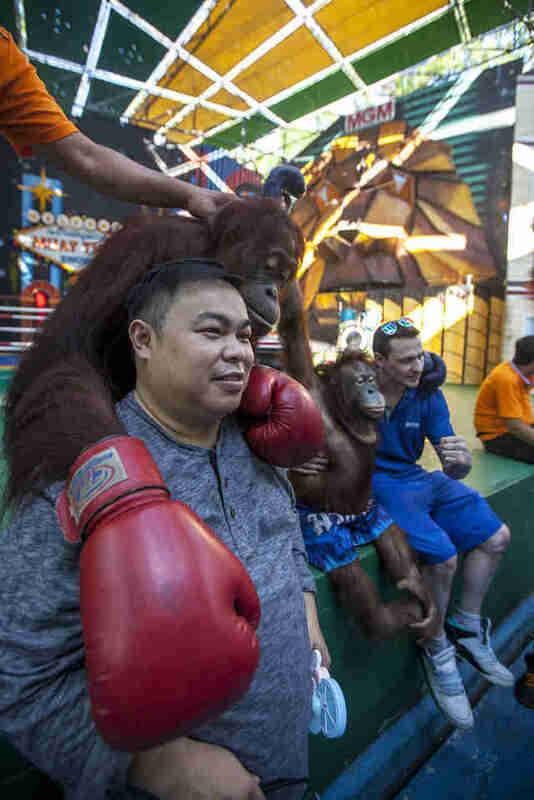 “I don’t want to anthropomorphize too much, but it [the orangutan] appeared under-stimulated, bored and was sedentary, probably due to its bulk,” he said. 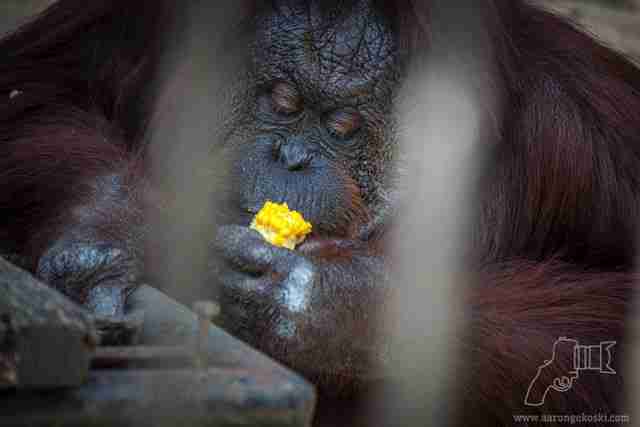 Besides the sweet corn, which isn’t part of their natural diet, it’s not entirely clear what the orangutan was being fed throughout the day. 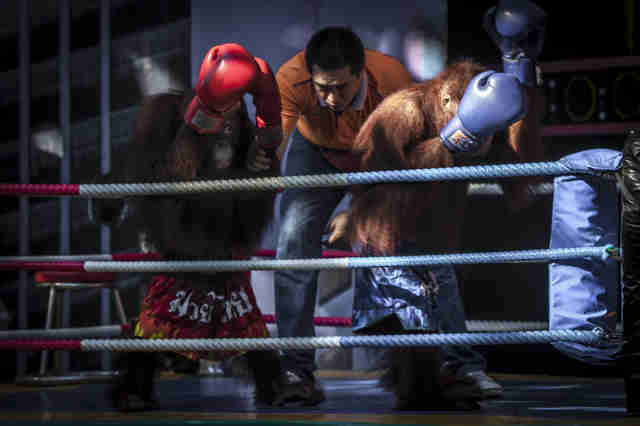 However, Tom Taylor, assistant director for Wildlife Friends Foundation Thailand (WFFT), a group that rescues animals from captivity and traffickers in Thailand, is sure the orangutan is being fed the wrong foods — and overfed at that. 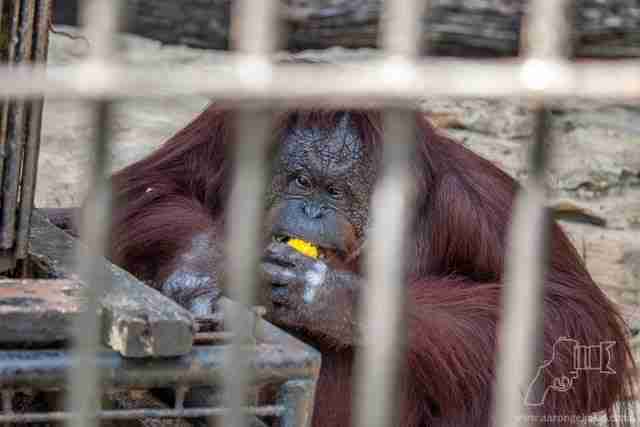 “The orangutan in question has likely been fed a very bad diet over its years in captivity,” Taylor told The Dodo. 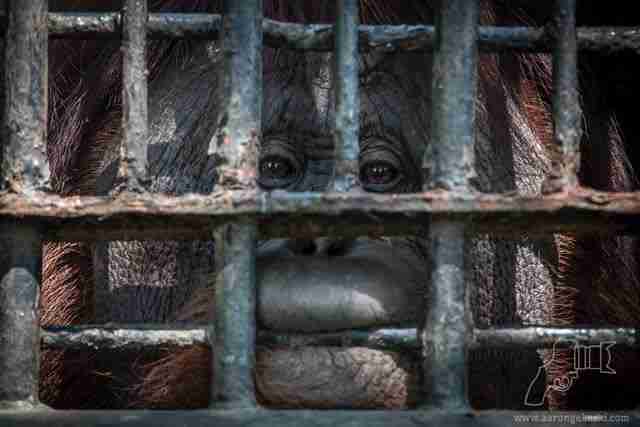 The orangutan is also being kept in a cage with several other individuals, despite the fact that male orangutans tend to be solitary animals — and these living conditions could stress him out even more. 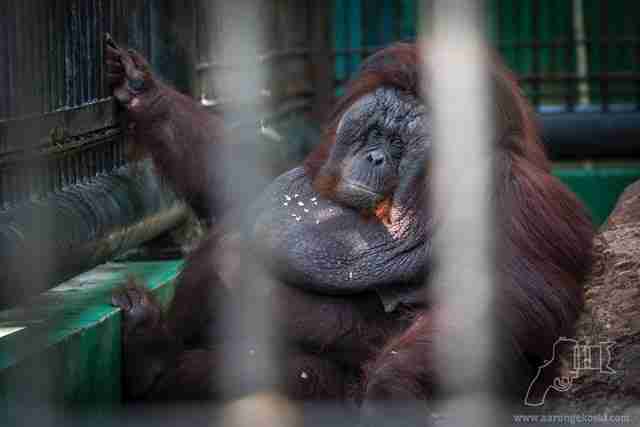 Unfortunately, this obese orangutan is just one of many animals who are suffering at Safari World. Most of the zoo’s other animals, including tigers, elephants, giraffes, rhinos and dolphins, live in “cramped, overcrowded, unsuitable habitats,” according to Taylor. The zoo also forces animals to perform in ways that are entirely unnatural to them — dolphins have to jump through rings; elephants are made to perform circus tricks and paint pictures; and baby tigers have to take bottles of milk from visitors. Visitors are also able to take selfies with many of the animals, including the orangutans, dolphins and giraffes. Sadly, Safari World isn’t the only place in Thailand that mistreats its animals — and many of them are marketed at unsuspecting tourists. Pata Zoo, another Bangkok facility, keeps animals in tiny, dark cages on the rooftop of a shopping mall. And at Phuket Safari Eco+, a roadside safari park on the touristic island of Phuket, chained macaque monkeys are forced in shows, riding bikes and lifting weights, while elephants are made to take visitors for rides on their backs. To train animals to perform in these ways, they’re subjected to cruel and abusive training routines. 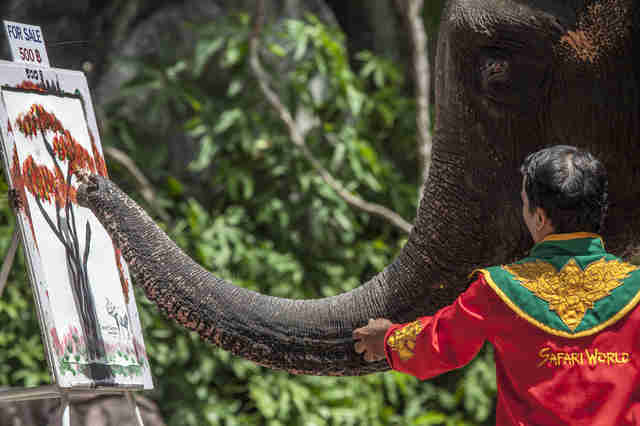 To help animals rescued from captivity in Thailand, you can make a donation to WFFT. You can also support efforts to document animal abuse and exploitation in Southeast Asia by making a donation to Gekoski, who plans to make a film about Thailand's wildlife tourism industry.